East Stroudsburg Borough is situated along Interstate 80 and U.S. Route 209 (Business) in southeastern Monroe County in the Pocono Mountains Region of Pennsylvania, just two miles west of the famous Delaware Water Gap. From Western Pennsylvania take Interstate 80 east to the East Stroudsburg Exit 308. From Southern Pennsylvania take PA Route 33 north to Route 209 north to I-80 east to the East Stroudsburg Exit 308. From the East (New Jersey) take I-80 west to the East Stroudsburg Exit 308. From the Exit 308 off ramps, turn right onto Prospect Street into town. Stay on Prospect St. (go straight) at first traffic signal by the entrance to Pocono Medical Center. Go straight and stay on Prospect St. at the second traffic signal by the entrance to East Stroudsburg University. Go 0.6 mile and turn left at STOP sign onto Analomink Street. The Borough Municipal Building is ahead one block on right, just past the railroad tracks. 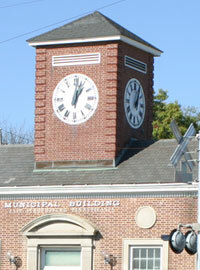 It is a red brick building with a clock tower on top. Public parking is available in metered spaces along Crystal Street which starts at Analomink St. in front of the Municipal Building. Parking is also available in municipal lots off both North/South Kistler Street, which is the road off Analomink St. along the railroad tracks. Free parking spaces (unmarked) are located toward the rear of the South Kistler Street parking lot. However, do not park in numbered spaces which are reserved (leased) spaces. If you turn onto N. Kistler St., the parking lot is just past the first side street (Yetter Street). 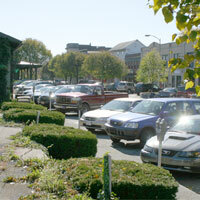 In either case the parking lots are within a short walking distance from the Municipal Building. Metered parking spaces in the downtown area are monitored and enforced from 8:00 a.m. until 5:00 p.m., Monday through Saturday. Follow the same directions above as for the Municipal Building. From Analomink Street continue across the railroad tracks past the East Stroudsburg Borough Municipal Building on the right. At STOP sign turn left onto South Courtland Street, Route 209 (Business) south. Go one block to traffic signal and make a hard right onto Day Street. 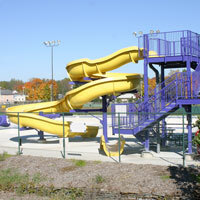 Entrance to Dansbury Park is only a short distance down on the left. From Route 209 (Business) south continue past Analomink St. as indicated above.